Students at Richmond's Woodville Elementary School received a copy of Friendship According to Humphrey to take home. A new initiative called “One Richmond, One Book” is working to improve reading and literacy skills in Richmond Public Schools. All elementary students in the district received their own copy of the same book Monday (10/22). “I have this awesome book that you get to take home!” said reading specialist Brooke McCann, showing Woodville Elementary kids a copy of their new book: Friendship According to Humphrey. The program’s being sponsored by the national literacy non-profit Read To Them, based in Richmond. John Dwyer is Executive Director. Dwyer says this is the first time they’ve been able to work district wide in Richmond. They launched a similar campaign in Virginia’s Northumberland, County in 2004 – and saw reading test scores rise from 60 to 90 percent the next year. 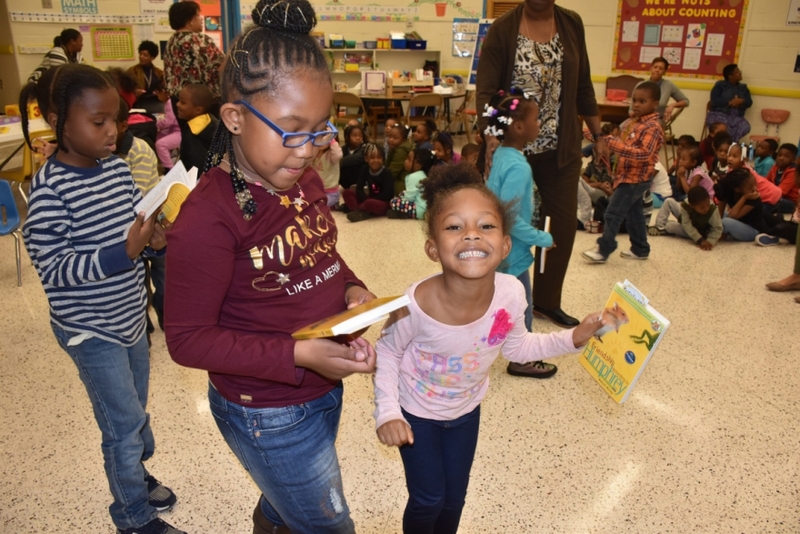 68 individual schools across the Commonwealth opted into the program last year through the “One Virginia, One Book” program, including schools in Petersburg, Hopewell, Norfolk, Hampton and Portsmouth. Bruce Coffey with Read to Them says they’ve seen a 50% increase in schools signing up this fall. Through “One Richmond, One Book,” all RPS elementary students will get a second book to take home in March, and another one for the summer break. How each school decides to incorporate the book into the school day will vary. At Woodville Elementary, it will be linked to the school’s Positive Behavior Interventions and Supports (PBIS) program. They have a bear system: students are identified as a golden bear, blue bear or pink bear depending on how they behave that day. Students who are "good bears" will be rewarded with one-on-one reading time with the principal, and others. And, she says, they’re hopefully learning a lesson about friendship while also acquiring new reading skills.